Friendship may be coming into vogue as a topic, and Rath takes a pragmatic rather than philosophical approach. He explores the inherent value of friendships and says that the need for friends goes beyond commonality or companionship; in particular, he devotes a section to friendship at work, which, unlike many companies and managers, Rath sees as a positive force. Rath's research shows that employees who have a best friend in the office are more productive, more likely to engage positively with customers, share new ideas and stay longer in a job. Rath shows that many people succeed or fail based on the support and involvement of their best friends. 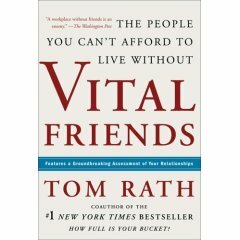 Rath posits eight vital roles friends play: some are champions for each other; some collaborate; some connect people with others; and some build each other up through encouragement and trust.